Air Compressors - Continuous Air Systems Inc.
Rotary screw compressors offer solutions to a broad array of standard compressed air needs. Featuring lubricated packages ranging from 5 to 500 HP and oil-free packages ranging from 20 to 150 HP, rotary screws are used in general applications such as producing utility air for plants and powering pneumatic tools in numerous industries worldwide. Smaller screws (30 HP and lower) are used in situations where low noise, ease of installation and low maintenance are key considerations. Larger reciprocating compressors are used in higher pressure applications (200 psi and up) which often require special design and equipment packaging. Examples are products Gardner Denver has custom built for NASA and the plastic bottle blowing industry. Small reciprocating compressors (30 HP and below) are used in numerous commercial applications where durability and cost are major considerations. Gardner Denver is pleased to announce the availability of the GD-Turbo, a new generation of multi-stage centrifugal air compressors. The GD Turbo incorporates the latest designs from aerospace and jet engine technology. Super computers and software programs were used as drawing tools for the GD Turbo, integrating aerodynamic patterns for the impeller and diffuser. The GD Turbo is the most advanced unit of centrifugal compressors in the world today in the 400 to 1,500 HP range. These units are designed to provide the best value and quickest return on your investment. They lead the centrifugal market in uncompromising oil-free air solutions. Gardner Denver rotary screw gas ends are well suited for natural gas compressor applications. All Gardner Denver gas compressors are constructed of ferrous metal. No yellow metals are used in the gas end construction. 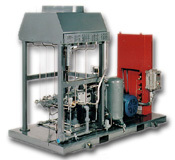 This allows the Gardner Denver Rotary Gas Compressor to be used in virtually any natural gas application.